Third class have been learning about The Vikings and Scandinavia in the last few weeks. They are using digital tools to learn more about The Vikings and to present what they have learned. The class is in groups and each group has their own Padlet with a KWL chart where they began with recording anyinformation they knew about the Vikings already; they then discussed in their group what they would like to find out about them and recorded this in the W section. They then used a Padlet created by their teacher with links to useful sites about the Vikings. This helped them to learn more about the Vikings and to watch short presentations about them. They then recorded this information in the L section on their Padlet. They are then using this information to create a Prezi - a presentation about The Vikings. 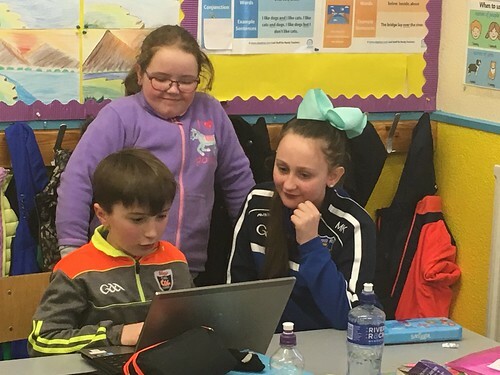 They are putting the finishing touches to these presentations and hope that they will be ready before St. Patrick's Day. Here you can see they are working hard! This is the 5th year of European Code Week. 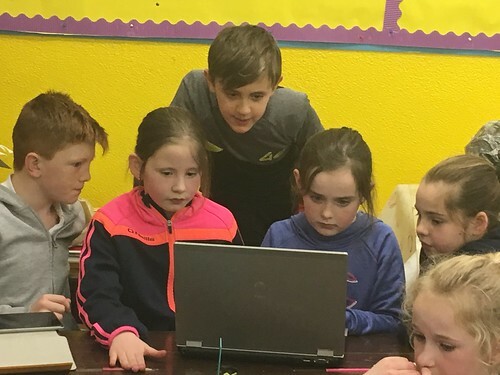 Children in 3rd class have made a start on Coding with Scratch and made great progress in just one session. 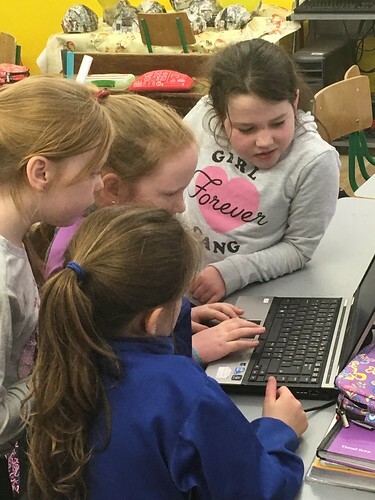 EU Code Week is just the start of their Scratch programming for the year as they will also be participating in a European eTwinning Scratch project where they will use Scratch to create presentations and mini projects for the other participating schools. This project will last the full school year and they are sure to have some great fun while also using many skills such as co-operative learning, peer-learning, problem-solving & thinking skills to name just a few! 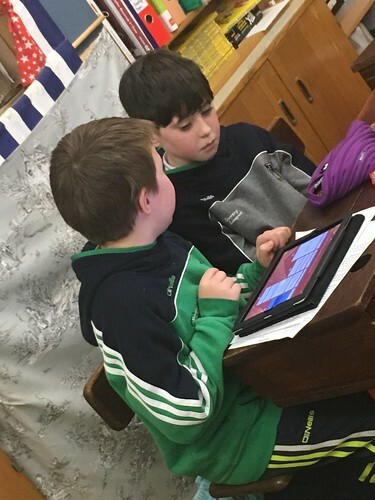 Pupils throughout the school will be participating in e-twinning projects throughout the school year. Children in 3rd - 5th class will be joining up with pupils from France to learn about each other's school life and National culture. 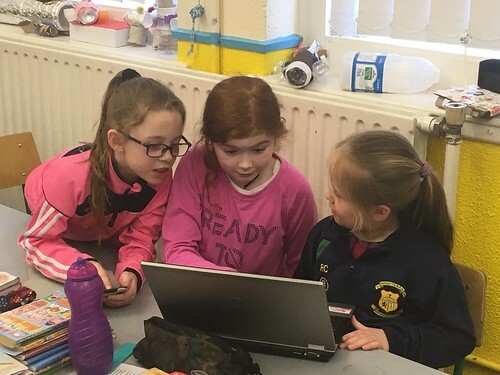 Pupils in 3rd class are hoping to participate in an international Novella project where each participating country will contribute a chapter in a story...lots more to come. We'll keep you posted! Technology plays an important role in our school...we have a set of school tablet computers that are used by each class on a timetabled basis. 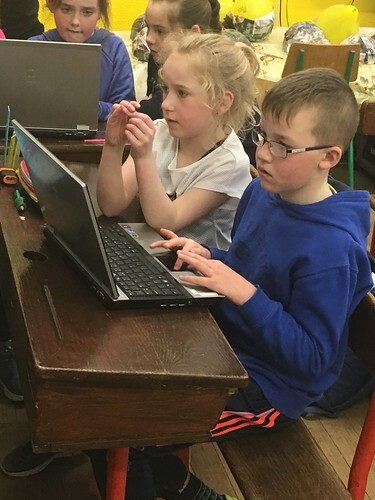 We also have some laptop computers that are used mainly by the senior classes, also on a timetabled basis. All classrooms have data projectors and visualisers that are used on a daily basis. All teachers make great use of technology for their own admin work as well as enhancing the lessons for the children. 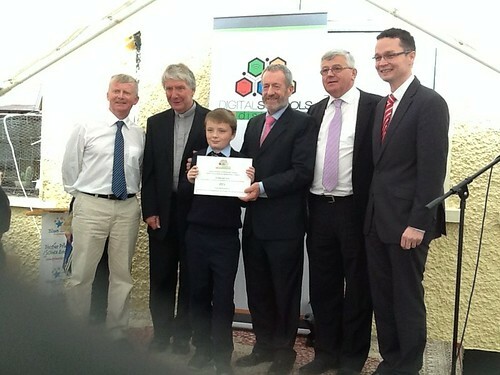 We were delighted to be awarded a 'Digital Schools of Distinction' award in May 2015 and held a very special awards day on October 9th when Mr Seán Kelly, MEP visited the school to officially present the award. We were delighted to also have Mr Tom Roche from Digital Schools of Distinction and Mr Patrick O' Donovan TD at the awards ceremony to celebrate our achievement.